The project aims to create a completely new class of ceramic oxide materials with advanced charge storage capabilities, opening a door to next-generation batteries with higher energy density, faster charging and a much longer lifetime. These new materials are two-dimensional (2D) oxide-based structures that are built by alternating oxide layers and electronically conductive layers, such as graphene-based compounds or transition metal carbides (MXenes). The resulting structures exhibit characteristics important for battery electrodes: space that allows ion movement, and conductive layers that enable fast transport of electrons. Combining layered metal oxides and carbon-based compounds in high quality layer-by-layer architecture offers an opportunity to discover and investigate new phenomena occurring at interfaces. This fundamental understanding is important for the creation of batteries with improved energy and power capabilities. The materials and methods Pomerantseva is developing in this work are relevant to a wider range of applications, including energy storage, electrochromics (responsible for reversible changes of colour), sensing, actuation (or control of movement), and water treatment. "When writing this proposal, I was inspired by outstanding research published by my mentors and colleagues," Pomerantseva said. "With this award, I feel privileged to have an opportunity to shed more light on the ways to solve one of the biggest issues of oxide electrodes in energy storage—their poor electronic conductivity. I would be excited to establish a new area of research: investigation of two-dimensional heterostructured oxide materials for electrochemical applications." 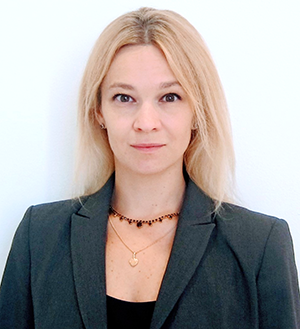 Pomerantseva is the Anne Stevens Assistant Professor in the Department of Materials Science and Engineering at Drexel University in Philadelphia. At Maryland, she was a postdoctoral researcher with Professor Reza Ghodssi (ECE/ISR), working in the MEMS Sensors and Actuators Laboratory.